With no Q6 working party, there is nothing to report other than the damaged copper ferrule has been removed and Mark O'Brien is now sourcing some suitable copper bar to make a replacement. The remaining flue tubes await having the chamfers cut. Bill is chasing up Mathew Storey about progress with the welding of the elements. Ian reports a fine dry, sunny but cold, day at Grosmont, with only three attending - Peter Ellis, Ian McCall, and Ian himself. No more mice to report again: we must have got them all at last! Usual cuppa, then it was eccentric work all day, with the two Ian's fitting and Peter making shims and assisting fitting the eccentrics where required. This is heavy work in a confined space. The right hand outer was shimmed first with 20 thou each side then tightened up. The cotter pin is still to make and fit. Then the left hand inner was fitted and shimmed, again 20 thou each side and tightened up. Then the last one, right hand inner, which still requires shims. All the syphon tubes were fitted into the oilways, but, unfortunately, the syphon on the left hand inner would not fit flush, protruding out a couple of inches even though the white metal had been drilled. This one will have to be dismantled and a larger hole drilled on Wednesday. All the trimmings for the syphon tubes are soaking in lube oil in a tub on the work bench. Lunch was had upstairs at the MPD. One flue tube is left to have the chamfer cut after the MPD boiler team's activities on Friday. All the ferrules have been brought up and are in a box on the workshop bench. Only a few visitors round today, about half a dozen, but that should increase next Saturday with Tornado in operation. be warned, it may be very cold! A bit of a grey day, but fairly mild with some sunshine later at Grosmont, with Derek Shorten, Ian McCall, Roy Marshall, Nigel Hall, Ian Pearson and myself. Usual cuppa and no mice to report again! Nigel, Roy, Derek and myself spent much of the day moving J27 parts from Deviation Shed down to the Fabrication Shop, and unloading Nigel's van - see separate J27 report. Ian P and Ian M started work on removing the 2 sets of eccentrics . First the left hand outer was taken down, the oil ways drilled through the white metal, and then re-fitted back onto the sheave (see photo). Lunch was had in Deviation Shed today due to the mild weather. After lunch, Ian P and Ian M continued to remove the right hand inner eccentric. This did not need any drilling but made the job of fitting the right hand outer much easier and with a little help from Chris (these eccentrics are quite heavy), this was fitted by the end of the day. These will need tightening and shimming where necessary. Now the left and right inner eccentrics can be fitted on Saturday. Derek continued to clean grime and rust from the vacuum and steam pipes under the cab and tender ready for a coat of paint. An inspection of lifting tackle was done today by the NYMR's inspector. He only wanted to look at strops and shackles and his records showed 6 strops and 2 shackles. But we only had 3 strops and 2 shackles in stock. The 2 shackles and two x 2 metre stops passed OK and have been marked up with yellow paint. The one metre strop failed, and this was disposed of. We now require some replacements: two x 2 metre and two x 1 metre strops. In future, if any strops are defective, please remove the label and keep for the inspector in a safe place - the filing cabinet in the upstairs store will do fine - and dispose of the defective strop. Barry Neesom has made 52 copper ferrules. These are in a box in the machine shop along with the remaining length of copper pipe. Ian will collect these on Saturday and take them to Deviation Shed. A start will be made on Friday to chamfer the remaining 6 flues. Ian reports a cold murky morning at Grosmont today with Trevor Willford, Peter Ellis and Ian himself. No mice to report, usual cuppa, and then the first job was to take the left hand big end down to the machine shop as requested by Owain. This is for re-metalling, then machining, which may be done later next week. Trevor was again working in the smoke box all day, and managed to remove another nut and nearly the last one, but alas time ran out. Very disappointing but he will get it out next Saturday. The other 3 eccentrics have been delivered to Deviation Shed, so Ian and Peter set about getting the left outside ready for fitting. With a struggle and a lot cursing and the use of the steps, they eventually got it fitted before lunch was taken upstairs at the MPD. After lunch they started to get the left inside ready, but found quite a bit of over run white metal between the brass and the eccentric casting. Its removal revealed that there were no oil ways drilled through the white metal. That started the alarm bells ringing about whether the oil ways been drilled on the 2 eccentrics already fitted. Ian went to check and found that the eccentric he and Peter had fitted earlier didn't have any oil ways, while the right hand inner only had one oil way drilled. These 2 eccentrics will have to be taken down, drilled and re- fitted next week. The oil way on the left hand inner eccentric was drilled out and this is now ready for fitting, along with the right hand outside eccentric which had its oil ways ready drilled by the MPD. Really frustrating and disheartening. Nigel Hall has brought one load of copper pipes for the J27 which are on pallets and have been placed in the four foot on No 8 road behind Hartland. The old main smoke box steam pipe has been put next to No5 - it may make a good flue for Bill's stove in due course! The J27 itself has been successfully coupled together, and subject to finding a replacement signalman for one who has gone sick, the J27 should be moved to Grosmont on Monday. Paul H will be checking it over at Pickering tomorrow and oiling up. When it arrives, the engine will go straight in to the Fabrication shop for work to start, while the tender will go into Deviation Shed on top of the Q6 tender. To achieve this, Hartland will be moved out of Deviation Shed and No 29 and Lucie will be moved into Hartland's space. Nigel is hoping to bring down the remaining smaller components, mainly from the brass store, on Wednesday, along with the photo album to guide those fitting cab pipework. A very cold, fairly bright, morning at Grosmont yesterday with Ian McCall, Derek Shorten, Steve Hyman, Jon Bradley, Ian Pearson and myself on my return from Australia - a 30C drop in temperature takes a bit of getting used to! Cups of tea all round and then work started with me going down to the MPD to discuss with Paul Middleton and Barney the movement of the J27 (or P3 as some people prefer to call it) to Grosmont, and the project plan for its completion and return to traffic. Derek set about cleaning the front part of the vacuum pipe situated behind the front buffer beam and then the left hand side rods. Ian M continued with the fitting of the side rod cotters, which are now complete. He also fitted the end caps to the trailing and intermediate side rod crank pins, and also the cap and castellated nut on the leading crank pin, secured with a split pin. While doing this work he noticed a missing plug from the trailing crank pin. This is a threaded plug which screws into the centre of the crank pin. There are 2 of these plugs each side, trailing and intermediate, so the intermediate one was removed and taken down to the MPD. Barney is going to see Owain and have one made. In addition, 2 sets of studs from the J pipe are also to be made, as the old ones are quite worn on the threads. Ian went to see Shaun Bowler regarding the poor fitting of the right hand inside eccentric and he came up to Deviation Shed to assist Ian P and Jon to take the eccentric down. Here we found that one of the bolts which eventually is coupled to the eccentric rod, and is located between the brass and the eccentric casting, was sitting slightly proud and pushing the brass upwards. This stud was removed and another fitted with more clearance. That gave a much better fitting eccentric but, when tightened up, we could not move the eccentric, so it was then given extra shims each side. A bit of trial and error at first with 5 thou no good, then 10 no good, then 15 and still tight when tightened up, so then 20 thou and this finally proved to be OK. So 2 shims were made and one fitted either side and the nuts and locking nuts were then tightened up. Now all that is required is two cotters making and fitting. Steve made a good job of cleaning the J pipe recess . On my return from the MPD, I made a start cleaning grime and rust from the steam heat pipe under the tender and also part of the first and second wheelsets on the right hand side. Lots of grime to remove so plenty of cleaning work and painting to do in this area! Lunch was had in Deviation Shed upstairs. Owain came up and measured the big end brasses and the journals. The right hand big end was OK but the left hand one needs to be remetalled. Ian reports another grey cold morning, with snow turning to sleet then rain, at Grosmont yesterday, with Peter Ellis, Trevor Wilford, Ian Pearson, and, later on, Alan Hardie after his delivery of fine ale to the Wheatsheaf pub at Egton. Also, apologies from Rachelle Martyn, busy with her studies. After the usual cuppa it was back into the smoke box for Trevor, trying to remove those awkward header nuts. Before he could start though, a plank of wood long enough for him to lay on had to be found. Eventually Trevor had to cut a piece to length to suit the width of the smoke box - more time consuming work. By the end of the day he only managed to remove one nut in such a confined space. The 2 nuts that are left are even more awkward to get at but they'll be removed eventually. 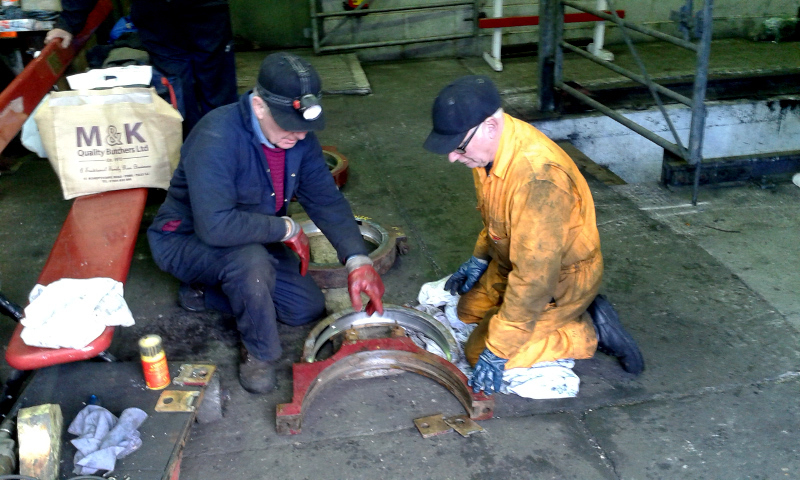 Ian and Peter fitted the right hand inner eccentric onto the sheave, this being the only one ready at the moment. This in itself was quite a task, with the two of them having to lift the top part of the eccentric over the top of the sheave and, with help from Trevor, then lifting the bottom part up and bolting the two sections together (see attached photo). Lunch was then had down at the MPD. Afterwards, Peter and Trevor had to take some items from the A4 container down to their car to take to York on Wednesday for Darrin. Ian and Alan went back to the eccentric to tighten it up, and all was going well, but then one side became tighter than the other and it became impossible to move the eccentric round. So it was slackened off slightly and it would move quite freely, but as soon we tightened each side a small amount at a time, one set of shims became tight and the other slack. This was worked on for about an hour or so, before it was decided to leave it on. The thought is that it will have to come off and maybe need some more machining. Ian spoke to Paul Middleton, who was working on Lucie, which is now in the boiler shop. Paul said he will talk to Shaun and Keith Pardy about it on Monday. As a result of this experience, it may be best if the outside eccentrics were fitted first, as there is little room to lift the outside ones on when the inside one is fitted. Peter has tightened the nuts which were still to do on the left hand cylinder cover, and all the nuts on the right hand cylinder cover, with the torque wrench. A four coach steam service and the DMU were running, now that the half term holiday service has started, but today it will be the dining set and DMU. Quite a few visitors round the shed as a result, and coins tinkling into the donation box. The next working party will be on Wednesday 14/02/18 - Valentine's day - so come and show your love for the Q6. As trains are running, the station cafe will be open for refreshments. Ian reports cold miserable weather, raining on and off all day at Grosmont today with a small, but perfectly formed, band of Trevor Wilford, Peter Ellis, and Ian. No mice to remove again, so the usual cuppa was consumed then work started with Trevor in the smokebox removing the header nuts with heat, a long chisel, and a hammer . Such an awkward job with very little room to work in. With Trevor having to lay on his back in such a confined space, he managed to get 3 nuts off this week, and 2 last week, so there's 3 left to remove. Ian has NDT 'd the left hand side rods and the photos sent to Barney at the MPD. Peter fitted washers and new split pins (which have been opened out) on the trailing left and right brake hanger pins. Lunch was had down at the MPD mess room today: too cold in Deviation Shed (come to Sydney where even the rain is hot - yes, it does rain here occasionally!). Afterwards, Peter set about filing the regulator handle square. This has had a small amount of weld put inside so as to give a solid fit to the regulator shaft. More work is still required on this item. Ian and Peter wound up the drawbar nut under the tender and removed the wooden packing that was supporting the spring. While under the loco, Ian noticed the new blow down discharge pipe might get in the way of the rear damper door. To check, the damper was opened and it was indeed found to catch the pipe so some adjustment will have to be made. Also the rear ash pan was emptied, with a barrow full of ash removed along with a pen and a paint brush. Not many folk about today, about ten in all maybe. Not that bad considering the poor weather. 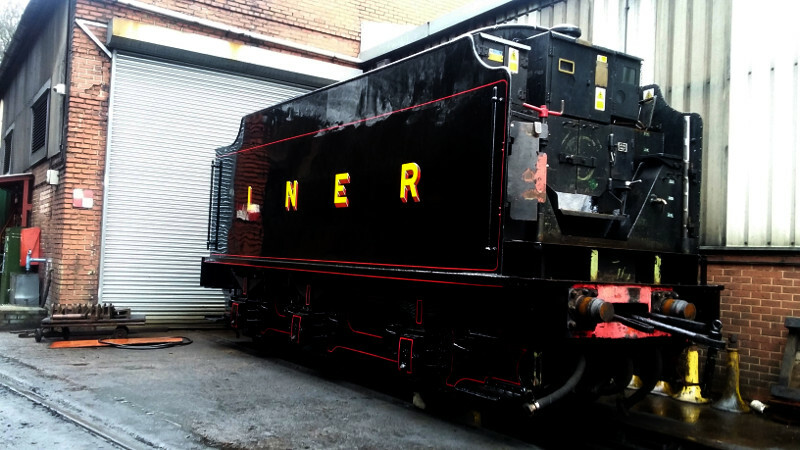 The B1 tender has been repainted in LNER livery by John Furness and looks very smart (see photo). Ian asks whether we can have the Q6 like it, but NER livery would be better still! Ian reports another cold grey morning at Grosmont yesterday with Trevor Wilford, Peter Ellis and Ian himself. Bill Dobson called in for half an hour to supervise some work and Bryan Orange was present with the Junior Volunteers who were split between Dame Vera Lynn, the MPD and the Q6. I will say nothing about the 30C temperature and cloudless blue skies that I am having to suffer at the moment! Cups of tea all round before work started with 2 JV's cleaning the eccentric sheaves which had accumulated quite a bit of rust due to the foundation ring being washed out a few weeks ago. These are now clean and have been oiled. Trevor and Peter brought up 6 x No.2 brake blocks from the MPD of which 4 have been fitted. The blocks had to be filed where the pin hole is situated due to a metal rag which had to be removed to allow the block to slide in position. One of the JV's was employed removing this material. 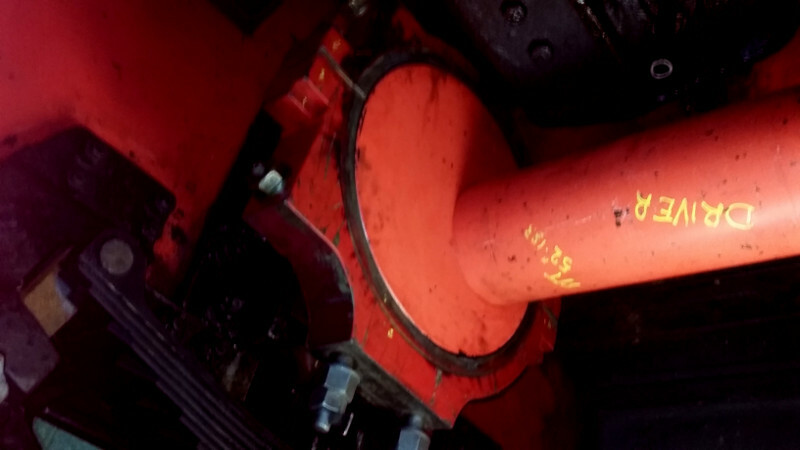 Three blocks were fitted to the right hand side and one to the left hand side, but before this latter one could be fitted, the loco had to be moved forward slightly so as to locate the pin through the block as the side rod was in the way. These all still require split pins. Two other JV's set about cleaning and rubbing down the 2 sections of steam heat pipe and the vacuum pipe. These are now painted with red oxide and can be undercoated next Wednesday. Bryan brought 3 new hand lamps: these are in the top locker, and Bill has acquired a pot bellied stove on Ebay to keep us warm this winter and cook our Parmo's and warm our Pies! Lunch was had in the mess room today - quite civilised. Bill Putman emailed me last Tuesday when I was out of contact to say that because of the bad weather you were all suffering, he had decided it would be best not to try and collect the Q6 tubes from Grosmont the next day on behalf of the Ryedale Model Engineers. He will try again, and hope that it is third time lucky, once the weather improves. Working party next Wednesday as usual - all welcome. Four of us on this sunny cold morning with a wind chill from the North, roller door kept shut most of the day. With Bill Dobson, Ian McCall, Roy Marshall and Ian Pearson which was just as well as I had only brought 4 Raspberry Doughnuts to share at lunch time. After the usual cuppa and no Mice to remove, Ian M and Ian P brought the 2 "60T " jacks and handles from the breakdown coach. These were set up at the front of the Loco on the beam and the engine then jacked up to allow us to rotate the wheel slightly and line up the left hand front coupling rod with the intermediate rod so as to fit the gradient pin. The pin was fitted successfully taper pin fitted new cotter made and fitted and secured with a split pin. Also a new cotter was made for the for the front part of the rear rod taper pin which was fitted and secured with a split pin. The left hand side only requires the intermediate and trailing end caps fitting tightening up and pinning. Bill was busy organising various jobs at the MPD with Barney, also assisting Ian M and Ian P with the side rods and supervising Roy who was in the firebox working on the ferrules all day. While the loco was jacked up all the metal packing was removed from the top and bottom of the axle boxes,unfortunately we had to move the beam and Jacks to the rear of the engine and jack it up to remove the rear packing. Both jacks and handles were returned to the breakdown coach and put in the cage and locked up and keys returned to the MPD office. Owain came up in the afternoon to measure the 2 right hand side bushes which require re-metaling these were taken down to the MPD and should be ready for fitting next Wednesday. Lunch was had in the workshop today much warmer with Raspberry Doughnuts for sweet. NDT inspection still to do on draw bar gear. Bill still looking for a stove on Ebay.